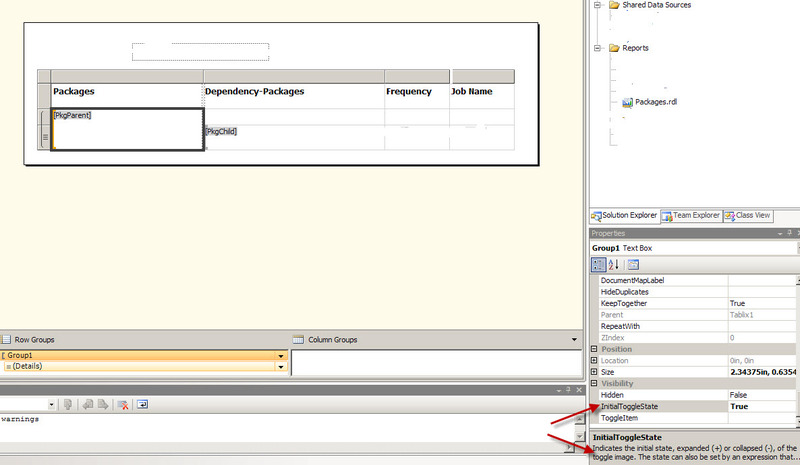 I was working on Developing a SSRS report which displays data about SSIS packages and package dependencies. To get a better perspective the report displays data about packages and its dependencies meaning which need to be completed before running a particular package. I created a stored procedure to provide data in a Master/Detail format and worked on presenting it in a SSRS report. In the report I had the detail row which was the dependencies, the main column on which the report was grouped on was the Parent/Master package column. 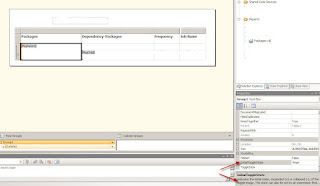 The idea was to provide a collapsible master/detail report such that when expanding the Parent package one can see the dependent packages in the detail on the same report. '+' sign was appearing before the Parent Package Value and also the details were shown. Ideally we should have the '-' sign appearing before the Parent Package name since all the details are show when the report is run initially. In order to handle this scenario I used a Property which is available for a column in the report, it is called the InitialToggleState Property. By default this property is to false, this was making the '+' sign appear before the column data in the report. I set it to True and ran the report, this displayed the data with the '-' sign in front of the Parent Package and the details were displayed in the same report. Thanks, I had a really hard time finding this setting. Your screen capture really helped. Glad I was able to help...With SSRS some of the features are found when the need arises, that is how it worked with me.